Residents wait for taxi transport beneath election posters in Pietermaritzburg in South Africa's KwaZulu Nataal province, April 29, 2014. ISIMANGALISO — If the African National Congress maintains its 65 percent majority in South Africa's May 7 election, it will be thanks in large part to rural ethnic Zulu voters such as Alfred Sabela. "We have water and a tar road. Before, we fetched water from the river," said 43-year-old Sabela, standing by the makeshift shop from which he hawks carvings near iSimangaliso Wetland Park, a major tourist attraction in a once-neglected area. The ANC's drive to develop this corner of KwaZulu-Natal province, 700 km (450 miles) southeast of Johannesburg, has paid dividends, notably by undermining the rival Inkatha Freedom Party (IFP), once the regional political force. The IFP's decline has accelerated under President Jacob Zuma, a 72-year-old Zulu with a rural upbringing and firm beliefs in traditional practices such as polygamy. 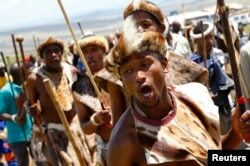 Zulu warriors dance to honor South Africa's late President Nelson Mandela on a hill above the graveyard within the Mandela family's property in the village of Qunu where Mandela was buried, Dec. 15, 2013. Zulus are South Africa's largest ethnic group, accounting for 28 percent of its 53 million people, and the ANC has worked hard to woo them away from the IFP, still headed by its 85-year-old founder, Mangosuthu Buthelezi, a senior Zulu royal figure. In the polls that ended apartheid in 1994, the IFP took KwaZulu-Natal and won 10.5 percent nationwide. But 10 years later, it lost the province, and by 2009 its nationwide share of the vote had dropped to just 4.5 percent. Recent polls in South Africa's Sunday Times newspaper now put the IFP's support at less than 3 percent, compared with more than 65 percent for the ANC, little-changed from its 2009 tally. Taking votes from the IFP, which literally battled the ANC in apartheid's dying days, is a key reason why the ANC looks set to maintain its large majority even as its support in towns and cities declines as memories of white-minority rule fade. "The ANC is continuing to grow in KwaZulu-Natal and so it can take some losses in urban areas," said Cape Town political analyst Nic Borain. As it enters its third decade in power, the ANC faces many challenges: 25 percent unemployment, a lack of strong economic growth, labor unrest and corruption scandals, most notably a $23 million state-funded "security upgrade" to Zuma's KwaZulu-Natal home that included a swimming pool and chicken run. Public frustration has boiled over into almost daily riots in townships around major cities by youths demanding jobs and better public services. But KwaZulu-Natal has been relatively unscathed - testimony to the ANC's efforts to "deliver" in the province. According to MunicipalIQ, a think tank, only 6 percent of major "service delivery" protests over the past 10 years have been in KwaZulu-Natal even though it is the second most populous of South Africa's nine provinces. "If you look at the developmental commitments to the provinces, it is clear to the naked eye that KwaZulu-Natal has been significantly favored," said Borain. According to Statistics South Africa's Poverty & Inequality unit, there are big contrasts between former homelands - areas where blacks were forced to live under apartheid - in KwaZulu-Natal and the Eastern Cape, a traditional ANC stronghold. Between 2001 and 2011, the number of brick houses in the old KwaZulu homeland more than doubled to 480,000, while in the Eastern Cape homeland areas the figure only rose a third. In the north of KwaZulu-Natal, the transformation has been startling. Under apartheid, the main infrastructure consisted of a dam to irrigate cotton - part of a strategy to blunt anti-apartheid sanctions - and a military road that snaked through uninhabited bush. A paved road has now replaced the dirt track leading to the Mozambican border, while other new roads wind through once-remote villages and on to tourist resorts on the coast. At the region's heart lies iSimangaliso Wetland Park, where big game has been reintroduced as part of a plan to create tourism jobs. The government has also all but eradicated malaria. "In the 1990s, 40,000 people a year were getting malaria each year in this region. That is down 99 percent now," said iSimangaliso chief executive Andrew Zaloumis, one of the early architects of the development scheme. "We asked at the time what were the blockages to investment, and it came down to malaria and roads," he told Reuters. Mary Barnes, a 35-year-old Zulu who runs her own catering business, said the changes meant her vote was sewn up. "I would vote for the present government. They might not be the best but they brought freedom. And they brought all of the infrastructure that is here," she told Reuters in her modest house, which has electricity and a large flat-screen TV. IFP officials admit that much has been done but say the ANC has neglected education and been wasteful. "We acknowledge the good things, but the ANC has only built 34 schools in KwaZulu-Natal. Children used to come to the province for school because of the quality of education under Prince Buthelezi," said IFP Secretary-General Sibongile Nkomo. Peace has also come to former ANC "no-go zones," such as the northern KwaZulu-Natal town of Pongola, where the local ANC chairman was assassinated two decades ago. "It was dangerous to be ANC here before, but not any more," said Bongani Sbiya, 28, as he pinned an ANC poster on a telegraph pole. "You see this nice road here? It was built by the ANC. South Africa: A Model of Democracy?